An easy & efficient way to build your Block Walls. 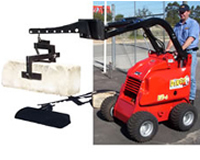 The Dingo Block Grab is an invaluable tool for any contractor building block walls. And of course, the Dingo’s compact size means you will be able to build block walls easily where larger machines will not fit. The Block grab is simply fastened to the Dingo Lifting Jib. The Block Grab is designed to grab and release the blocks without the operator having to leave the Operators Platform. Hire Companies: The Block Grab is an easy and cheap way to make your Dingo even more hireable. Used For: Lifting limestone, cement blocks for retaining walls etc. Used By: Dingo Contractors, Landscapers, retaining wall contractors, Hire companies.